This striking home was designed by Skylab Architecture, utilizing a series of ground-breaking techniques created to improve the efficiency of residential construction and the accessibility of progressive design. The residence, comprised of 28 prefabricated triangular units, features a wholly unique footprint and series of angular shapes. Pistils worked closely with the homeowner to create a hardscape and planting design that complemented and seamlessly integrated with the home’s singular architecture. Both triangular and hexagonal patterns can be found throughout the hardscape. Examples include custom-fabricated steel wood-burning fire pit and screening trellis, as well as a series of diagonal concrete retaining walls and hexagonal pavers. 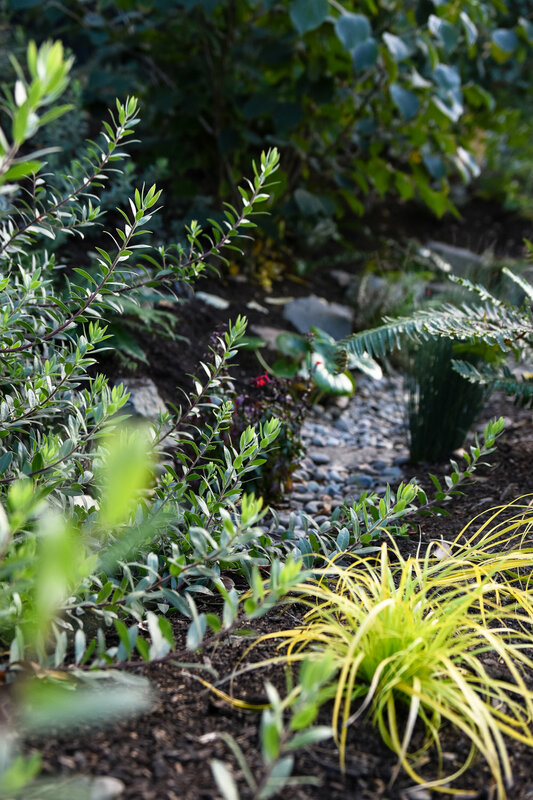 A large rain garden, located in the front yard, has a hardy mix of natives and water-loving plants to help mitigate stormwater and to encourage wildlife habitat. Additionally, a variety of trees, shrubs and perennials were selected to activate the garden year-round and soften edges. Highlights of the softscape include Manzanita, Japanese Forest Grass, Farfugium, Hosta and Anemone.